A biopsy is one of the more common diagnostic procedures performed in dogs and people. Skin biopsies provide valuable insight into the type of cells in an abnormal area of skin or a skin growth and whether the growth poses a more serious health threat to your pet. 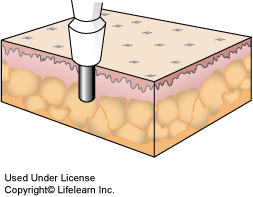 What is involved in a skin biopsy? Most skin biopsies are performed on a suspicious skin growth or on an area of skin that has failed to respond to symptomatic treatment. In many cases, the area to be biopsied is numbed with a local anesthetic. In some cases, depending on the area involved or the nature of the patient, it may be necessary to give the patient a general anesthetic, Either the entire mass or a small representative section of skin is removed and submitted to a veterinary pathologist, who will perform a histopathology analysis (examine the tissues under a microscope). The pathologist will attempt to determine the nature of the lesion, identifying the type of cells and their relationship to each other, as well as any evidence of malignancy. Most skin biopsies are very small and require few sutures ("stitches"). If you need to provide any home care to the biopsy site after your cat returns home, your veterinarian will explain this in detail. When should my dog have a skin biopsy? 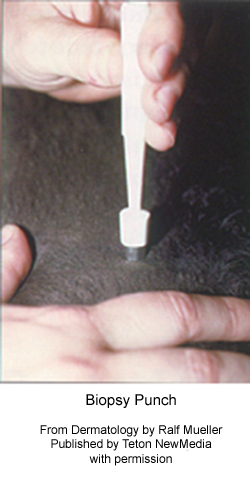 Any suspicious skin lesion or any area of poorly healing or abnormal skin should be biopsied. Veterinarians are particularly concerned about any skin masses that are "dark and domed" - characteristics often associated with malignant skin tumors or a mass that appears suddenly or grows rapidly. Additionally, skin that is chronically inflamed or irritated, or has an unusual color or texture should be biopsied. "Skin masses that are "dark and domed" - characteristics often associated with malignant skin tumors." What does a biopsy tell us about my dog's skin? Skin biopsies are beneficial in large part because they tell us whether we should be concerned about a lesion. A biopsy provides information about the nature of the abnormality, and will differentiate between infections, allergic skin disease, autoimmune skin disease, and cancer, either benign or malignant. By determining the nature of the abnormality, your veterinarian will be able to determine the most appropriate treatment of the condition. Finally, a skin biopsy will allow your veterinarian to determine the prognosis for the condition so that you will know what to expect during the course of the disease. In most cases, your veterinarian submits the biopsy samples to a veterinary laboratory, where a board-certified veterinary pathologist will evaluate them. 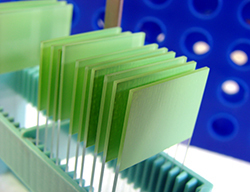 It usually will take one to two weeks for the samples to be properly processed and examined, although results can sometimes be obtained faster if the patient's condition requires it. During the time you are waiting on the results, be sure to monitor your dog carefully for any new skin lesions or changes in existing lesions. If you observe any changes, report them to your veterinarian as soon as possible. Certain skin diseases such as immune-mediated skin disease can change rapidly or certain types of tumors such as mast cell tumors can worsen or even spread after skin biopsy. "Certain skin diseases... can change rapidly... or even spread after skin biopsy." Skin biopsy is a relatively simple, painless procedure that can speed recovery and improve quality of life for many patients. If you observe any abnormal skin on your dog, be sure to notify your veterinarian, who will help you determine the most appropriate treatment for your pet. A biopsy is one of the more common diagnostic procedures performed in cats and people. Skin biopsies provide valuable insight into the type of cells contained in an abnormal area of skin or a skin growth, and whether the lesion poses a more serious health threat to your pet. Most skin biopsies are performed on a suspicious skin growth or on an area of skin that has failed to respond to symptomatic treatment. 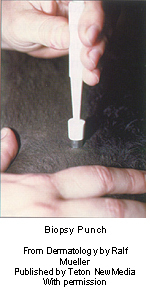 In many cases, the area to be biopsied is numbed with a local anesthetic. In some cases, depending on the area involved or the nature of the patient, it may be necessary to give the patient a general anesthetic. Either the entire mass or a small representative section of skin is removed and submitted to a veterinary pathologist, who will perform a histopathology analysis (examine the tissues under a microscope). The pathologist will attempt to determine the nature of the lesion, identifying the type of cells, their relationship to each other, and any evidence of malignancy. Most skin biopsies are very small and require few sutures ("stitches"). If you need to provide any home care to the biopsy site after your cat returns home, your veterinarian will explain this in detail. When should my cat have a skin biopsy? Any suspicious skin lesion, or any area of poorly healing or abnormal skin, should be biopsied. "...skin masses that are "dark and domed" - characteristics often associated with malignant skin tumors..."
Veterinarians are particularly concerned about any skin masses that are "dark and domed" - characteristics often associated with malignant skin tumors or a mass that appears suddenly or grows rapidly. Additionally, skin that is chronically inflamed or irritated, or has an unusual color or texture should be biopsied. What does a biopsy tell us about my cat's skin? Skin biopsies are beneficial in large part because they tell us whether we should be concerned about a lesion. A biopsy provides information about the nature of the abnormality, and will differentiate between infections, allergic skin disease, autoimmune skin disease, and cancer, either benign or malignant. By determining the nature of the abnormality, your veterinarian will be able to determine the most appropriate treatment of the condition. Finally, a skin biopsy will allow your veterinarian to determine the prognosis for the condition, so that you will know what to expect during the course of the disease. In most cases, your veterinarian submits the biopsy samples to a veterinary laboratory, where a board-certified veterinary pathologist will evaluate them. It usually will take one to two weeks for the samples to be properly processed and examined, although results can sometimes be obtained faster if the patient's condition requires it. "Certain skin diseases...can change rapidly...or even spread after skin biopsy. " During the time you are waiting on the results, be sure to monitor your cat carefully for any new skin lesions or changes in existing lesions. If you observe any changes, report them to your veterinarian as soon as possible. Certain skin diseases such as immune-mediated skin disease can change rapidly or certain types of tumors such as mast cell tumors can worsen or even spread after skin biopsy. Skin biopsy is a relatively simple, painless procedure that can speed recovery and improve quality of life for many patients. If you observe any abnormal skin on your cat, be sure to notify your veterinarian, who will help you determine the most appropriate treatment for your pet.